There cannot be a better golfing challenge than Royal Cinque Ports at Deal but this impressive Kent links course held no terror for Stephen Barnhurst who scored an impressive 37 points to win the President’s Trophy. That was the good news for Stephen from Broadbean, the bad news is that he was cut two shots so that he will now play off 14 handicap for his next three appearances with the Society and like so many others at previous Northcliffe golfing fixtures, he failed to back himself in the fund raising “Back the Winner” competition so there is now a nice carry over amount for the Society’s extra “Summer Bonus” event at Northwood Golf Club. The weather was kind with blustery winds, blue skies and warm sunshine making conditions almost perfect but it took so many players a few holes to adjust to the challenge of playing such a strong links golf course. With the Scottish Open and the Open Golf Championships showing just how difficult it is to play “links golf”, Stephen’s win was particular good. In second place was recently retired Ian McGowan from dmg media who was cut one shot to 10 handicap for his 32 points and Jobsite’s Rob Thomas was third with 28pts. The afternoon greensomes competition for the Viscountess Rothermere Trophy was won by Jonathan Brooke from Jobsite and morning runner-up Ian who played off his new handicap. They scored an impressive 35 pts with Rob Thomas and morning winner Steven, playing off his new handicap scoring 25 pts. 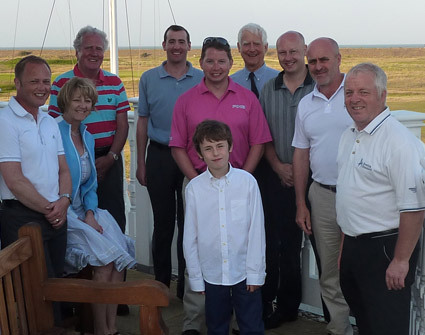 The Society was joined for the day by Hardelot’s Director of Golf, Ken Strachan, who travelled over from France with his young nine year-old son Darren. Playing a true links course for the first time, Darren, a 16 handicapper who is the fifth best golfer for his age in France, scored 33 points. Nearest the Pin in the morning on the fourth hole was the Daily Mail’s Alistair Sinclair and in the afternoon Stephen Byrne from Euromoney. Alistair was the only person to manage a two and collected £20. The Society’s next fixture is the “Summer Bonus” event at Northwood, Middlesex for the Tom Marlowe trophy, costing £35 all inclusive. This extra event will count towards the Order of Merit.